This was the year that I vowed I would purposely do something about my health. I’ve gained a lot of weight from my two pregnancies and I’ve become somewhat sedentary, and I have a lot of life left to live both with my girls and for myself. My biggest hurdle to overcome is time and presence. I can’t afford a lot of extra time in my day to day routines on my own, so the travel time to and from workouts would have to be minimal or nonexistent. My workout during the week would need to be done after our daughters’ bed time routines, and I would prefer to be within earshot in case there are any issues. So that left working out at home. My past experience with getting in shape has shown me that I need a lot of variety, and I don’t like to ‘feel’ like I am working out. There needs to be some level of enjoyment to my routines, or I will just stop doing it. Xbox has launched a few new games that are played with the Kinect Sensor and I will be reviewing them over the next few months. When I first heard about this opportunity I was pretty excited. Now that I’ve had the chance to get to know the system and the games, I can’t put in to words how happy I am to have been introduced to this. The variety of active games makes me look forward to turning it on and getting started at the end of my day. Before I get in to the first game I have been reviewing, I need to share a little background on the Kinect Sensor. The Kinect Sensor works with the Xbox console and basically turns you in to the remote. You control the games with either your hand movements, or with your voice. It reminds me of those TV shows where you see a blown up computer screen projected in to the room and the person is waving their hands and screens are opening and closing. Its pretty cool stuff. When you play a game that requires the Kinect Sensor, that means it is a full body game and you won’t be sitting on the couch. It finds your whole body and it can follow you no matter how fast or slow you are moving. The character movements are in real time and match mine as I go. It can track my three and a half year old, so she can play some of the games as well, and she is pretty good. Since the Kinect games are more active, they are wonderful for really cold or hot days, making winter workouts so easy. Depending on the game, it can track multiple players at once so you can play along with others. 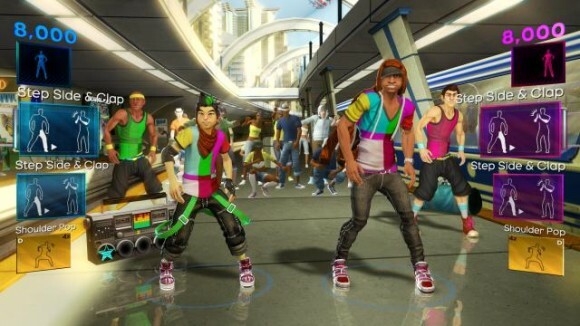 As part of their winter fitness lineup, the first game I am reviewing is Dance Central 2. It is the follow up to the best-selling game, Dance Central. 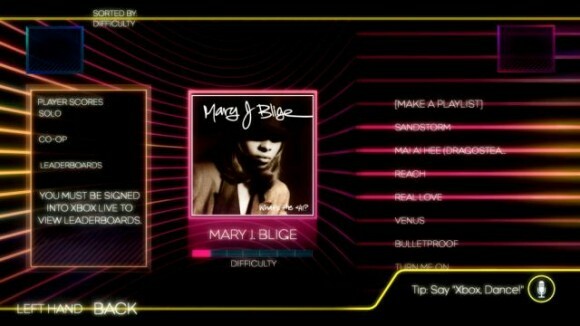 Dance Central 2 has a long list of songs that you dance to by mirroring the dancer on the screen. From the first time I tried this, I was hooked. I did okay when I first put it on, but not great. The best part was that I was alone in our basement so I didn’t have to worry about anyone staring. I just gave it all I had and probably missed a lot of steps but who cares? It was exercise, and I was sweating. If you just want to dance, you pick your song, the difficulty level (Easy, Medium or Hard) and you can begin. You can also customize the dancer that you want to mirror when you dance and the location that you want the dance to take place in. While you dance to the song, the Kinect Sensor shows an image of you in the top right (or left if you are doing two players) of the screen. This was helpful because I kept getting low marks on one move and I thought I was doing it right until I watched myself and realized that I wasn’t doing anything like what the dancer was doing. Up to two people can dance at the same time which makes it fun for the whole family. The sensors can pick up our daughter (3 1/2 years old) so she can dance along with us to some of the songs. A feature here that I like is that you don’t get kicked out of a dance because you can’t do it. Since my daughter is young, she can’t match the moves of the dancer, but she doesn’t know that because her player just keeps on going and she has a lot of fun. During the song, there is a freestyle section where the Kinect Sensor takes snapshots of you busting a move and plays them back to you, and a final picture is taken at the end of the song so you can see how you ended off. If you want to learn the steps to the various songs one at a time, they have a ‘Break it Down’ practice mode that will teach you how to dance. While practicing, if you nail the move right away, then you go on to the next move. If you are off, then you keep trying it until you get it right three times. I’ve done this on a couple of the songs, and my scores improved. One of my favorite features of this game is the ‘Fitness’ option. If you are interested in seeing your progress, you can turn on the fitness tracker and as long as you are signed in under your profile, it will track the total time you danced both during your current session and all time. It will also track your current and all time calories burned and it will keep a running total of how many songs were played and the average calories per song. Within the Fitness option, you can also opt to do a series of songs that focus on a certain goal. For example, the first option is called the ‘Easy Start’. It is just over 20 minutes and has 8 songs in it that are on the easy side to do, but that will still get you moving and warmed up for more. You can also choose to do a Crew Challenge. In this section, you dance with a crew and try to impress them and move on to meeting new crews as you get better. After you complete a certain number of songs with them, you get to do a final challenge, then you unlock more crews to dance with. Here is a short trailer so you can see how the dancers move. I’ve been doing this at least every second day (some times it is daily) for about a week and a half now and I am really enjoying it. I love that I can run down after our girls go to sleep and put it on and be dancing within minutes. No packing up and driving to a gym, or feeling self-conscious while trying to learn the moves. Our youngest daughter has been teething, so it is nice to be able to have fun and lose weight while still being within earshot of the baby monitor in case both girls wake up at the same time, which has happened. Then I just pause the game, do what I need to do, and come right back to it when everyone settles down. With each review, I will share my weight-loss progress. I started this year at 225 pounds. I weighed myself just before writing this post and I am at 218 pounds. I’m sure the first pounds to go are the easiest, but I will keep at it no matter how much I do or don’t lose. If you want to learn more about Xbox, the Kinect Sensor, Dance Central 2 or any other games they have, make sure you visit the Xbox/Kinect Website. You can find the Xbox 360 console, Kinect Sensor and Dance Central 2 anywhere that video games are sold in stores. 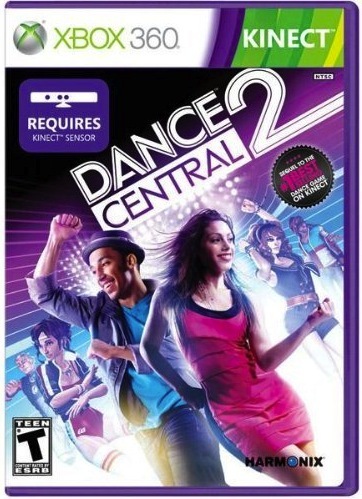 You can also purchase Dance Central 2 on Amazon.com for $29.99 or Amazon.ca for $46.99. Too cold outside to go shopping? You can order everything right from the comfort of your own chair. 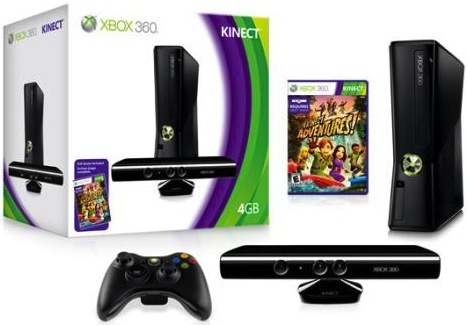 The Xbox 360 console is also bundled with the Kinect Sensor and a Kinect Adventure Game. You can purchase this on Amazon.com for $277.33 or on Amazon.ca for $299.00. I’ll be back in a few weeks with my next review. If you like playing sports games, you’ll want to check back in. I don’t think I could do without one now. great post, sounds exactly what I need. Is this a giveaway? how do we enter? Hi Pamela, not a giveaway. Just my review and experiences for those who are considering purchasing one or looking for ways to lose weight. The Xbox 360 console, Kinect Sensor and Dance Central 2, sounds like a fun way to lose weight. Like you said, there is no need to pack up and drive to and from the gym, when you are in the comfort of your own home, dancing your heart away, with your girls near you. We know you, Sheri, and once you put your mind to something we know you will achieve it. You go girl!! !